Mahi mahi, wahoo, tuna, blue marlin, sailfish, barracuda - these are just some of the top species that you will get the chance to go after on your Nassau Bahamas fishing excursion. Nassau and the Bahamas in general are renowned throughout the globe for their excellent fishing opportunities! Nassau is a top vacation destination thanks to its amazing resorts, great activities, but most of all, great fishing! No visit to Nassau Bahamas is complete without getting on a boat and experiencing the world-class fishing available here. Born Free is one of the top fishing operations in the Bahamas. This team is comprised of only the most experienced and dedicated of local fishing guides. The Born Free II is the smaller boat in our fleet which is great for smaller parties. The boat is a 35-foot Allman Sportfisher that is great for groups of 4 or less. The boat features a small cabin and a bathroom, as well as comfortable benches on a covered deck. Like the rest of the boats offered by us, the vessel comes fully equipped with everything you need to make those catches, including high quality Penn International rods and reels. With the experience of the captains and only the best fishing gear available, you will be able to experience either a Bahamas light tackle fishing trip or an offshore deep sea trip. The best part of fishing in the Bahamas is that there is always something to catch! Even just a few miles offshore, you will quickly be feeling a pull on your rod. The weather in the Bahamas stays warm throughout the year, and the marine life stays very active. Check out our fishing calendar to see what fish will be in season during your visit, but you can rest assured that there is always plenty of fish species to catch! Plus, when you are fishing with the team behind the Born Free II, you can be confident that you will be provided with only the best Nassau fishing trip possible! We provide bottled water and a cooler with ice. You are welcome to bring other beverages as long as they are not in glass containers. 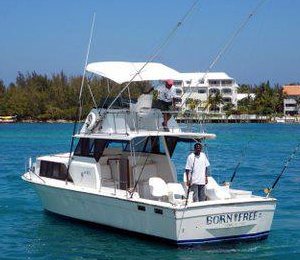 I have been to the Bahamas many times, but The Born Free II - 35' Allman Sportfisher is one of my favorite trips! It includes everything that everyone should do here. As a Bahamas veteran, I can say only the best about this experience!